Home / Baby Products / Princess Potty Training Gift Set with Book, Potty Chart, Star Magnets, and Reward Crown for Toddler Girls. 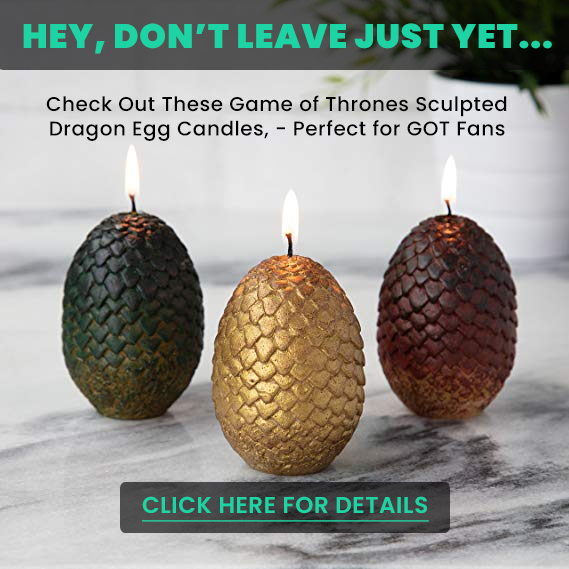 Comes in Castle Gift Box. 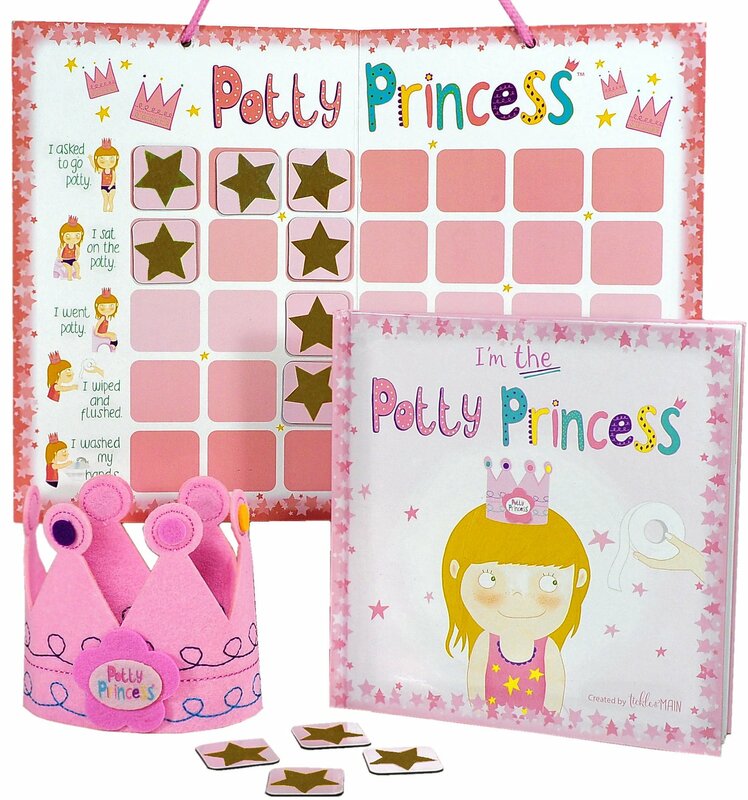 POTTY PRINCESS TRAINING SET contains everything you need to successfully potty train your child. It is a creative, unique, and fun way to get any child engaged in the potty training process! The 3 piece set includes a fully illustrated rhyming storybook about a little girl who is learning how to use the potty. It includes a chart with magnet reward stars for your child to stay engaged and keep track of progress. 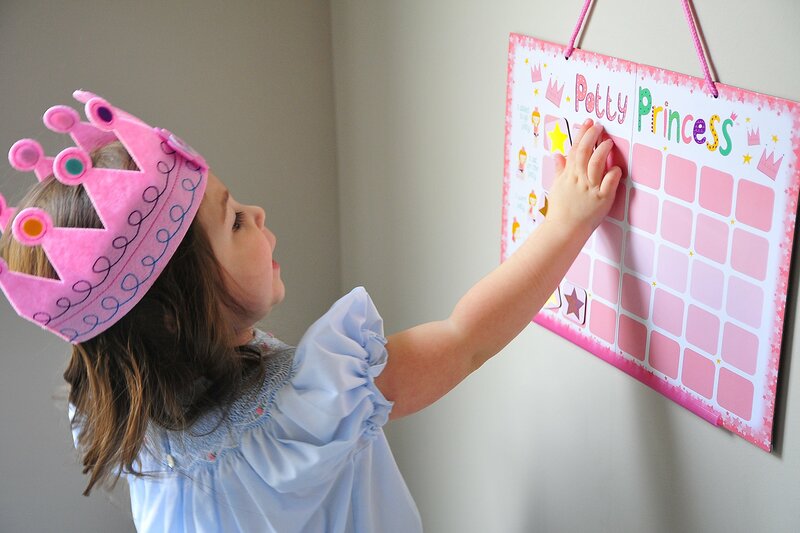 The set also includes an adorable Potty Princess felt crown as a fabulous reward! 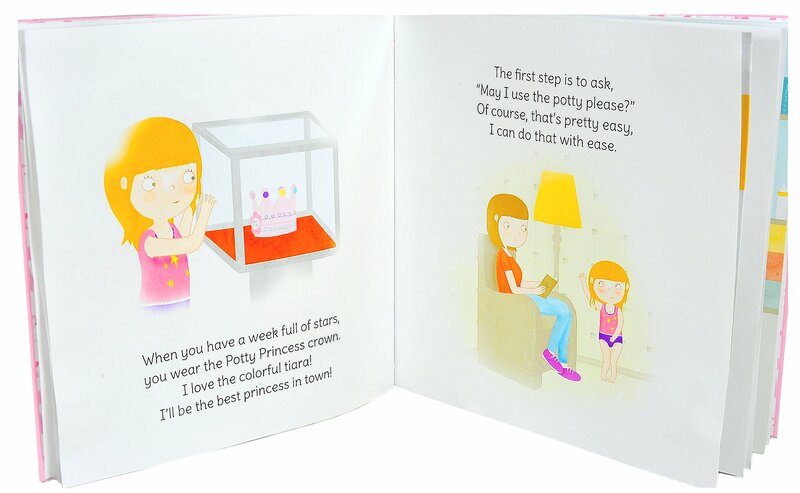 I’M THE POTTY PRINCESS STORYBOOK is a delightful rhyming story written by Jennifer Driscoll and illustrated by Ana Santos about a little girl who wants to stop wearing diapers so that she can be more like a princess. 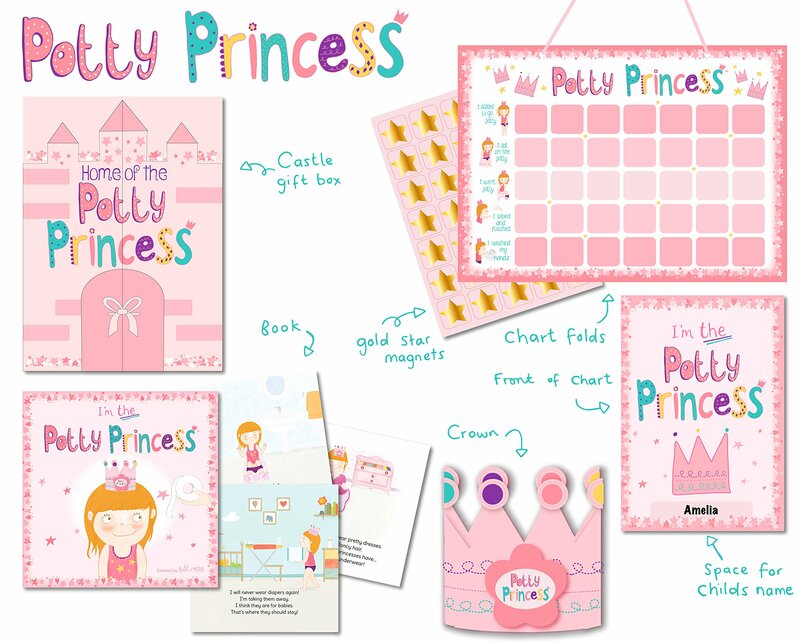 The book features all of the necessary steps a child must go through and includes engaging artwork and references to the chart and crown that are included with this set. The hardcover book measures 7.25″ square and includes 24 colorful illustrations. 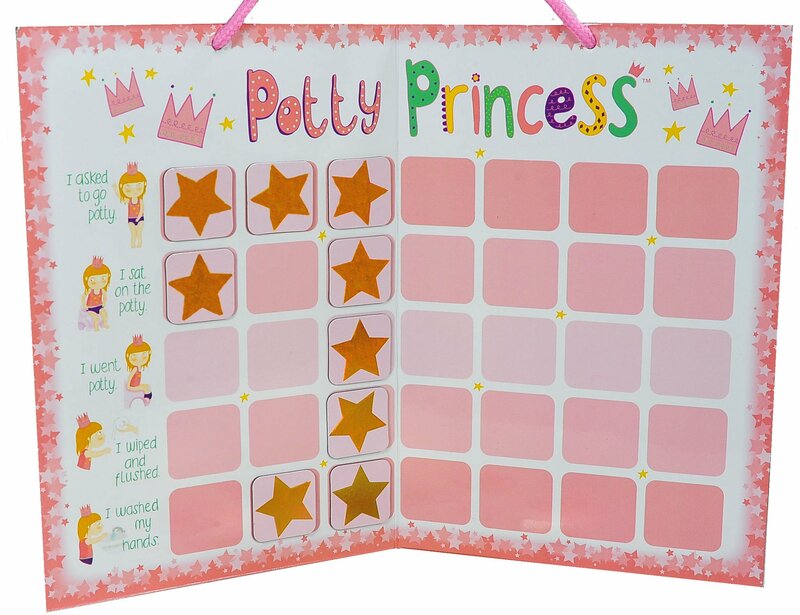 POTTY PRINCESS MAGNETIC CHART is a progress and reward chart measuring 10″ x 14″ and includes the important steps that a child must take during potty training. The chart comes with 35 gold star reward magnets to provide positive reinforcement each time your child completes a step. Steps include: I asked to go potty. I sat on the potty. I went potty. I wiped and flushed. I washed my hands. Each time your child completes a step, a star magnet can be given that reinforces the positive behavior. 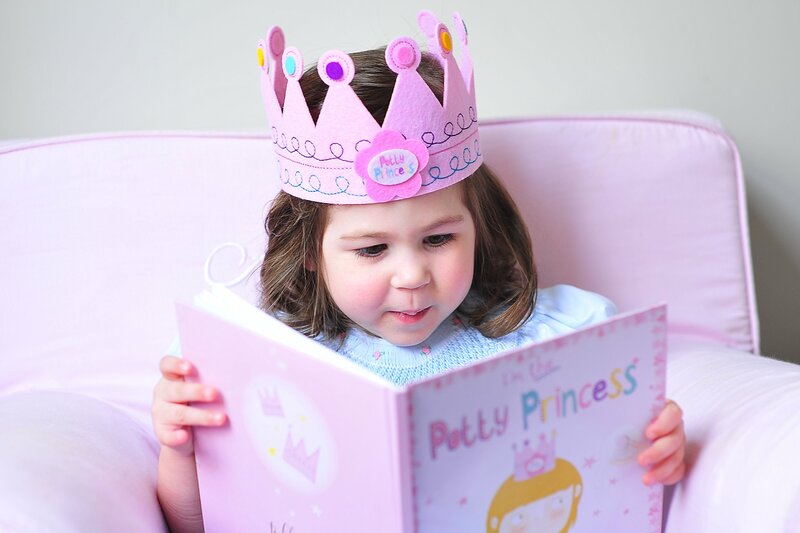 POTTY PRINCESS CROWN is made of soft high quality felt with handstitched details. It fits on top of the head like a hat and has an elastic band in the back which allows for expansion and keeps the hat in place. The felt crown has colorful round tips and measures 4 inches tall and fits girls ages 2-8. GIFT READY CASTLE BOX – Potty Princess Set comes in an adorable castle box ready for gift giving. Little girls love to see the castle gift box presentation that reads “Home of the Potty Princess”. The box is pink with colorful accents and is complete with a gros grain ribbon on the front door.